Kengo Nikawa (then, 59) was exposed to the bomb crossing the Kan-on Bridge by bike going from his home to his assigned building demolition site in the center of the city. He suffered major burns on his right shoulder, back, and head and took refuge in Kochi-mura Saiki-gun. He died on August 22. Kengo was never without this precious watch given him by his son, Kazuo. 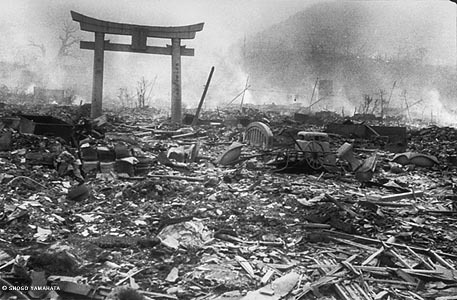 Sixty nine years ago today, on August 6, 1945, at 8:15 in the morning, the American B-29 bomber Enola Gay dropped an atomic bomb over the center of the city of Hiroshima, Japan. 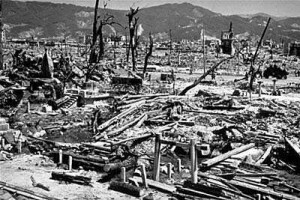 Hiroshima was one of the last targets that the U.S. government attacked in a half year of unrelenting, devastating firebombing of over 60 Japanese cities. 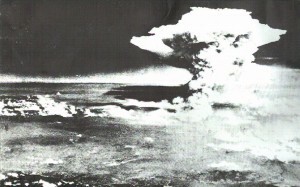 It was also the first target ever attacked with nuclear weapons in the history of the world. The bomb exploded about 200 yards over the city, creating a 13 kiloton explosion, a fireball, a shock-wave, and a burst of radiation. 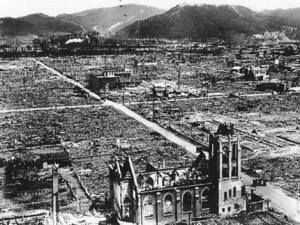 On the day that the bomb was dropped, there were about 255,000-300,000 people living in Hiroshima. On that bright morning in August, there was a sudden flash, brighter than the sun, and then sky went dark, buildings were thrown into the ground, and everything began to burn. People staggered through the ruins, with their eyes blinded, with their clothing burned off their bodies, with their own skin and faces burned off in the heat. Everyone was desperate for water, because they were burning, because everything was unbearably hot. They begged soldiers for water from their canteens; they drowned themselves in cisterns. Later, black rain began to fall from the darkened sky. The people thought it was a deliverance. They tried to catch the black rain on their tongues, or they caught it and drank it out of cups. But they didn’t know that the rain was fallout. 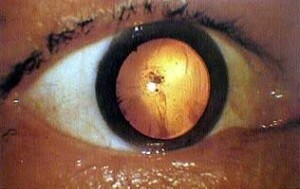 They didn’t know that it was full of radiation and as they drank it it was burning them away from the inside. There was no refuge, no sanctuary; there was nobody to help. The city was burning, the doctors and nurses were almost all downtown. The bomb exploded directly over one of the major clinics, and over 90% of the doctors, and over 90% of the nurses, were killed or injured in the bombing. 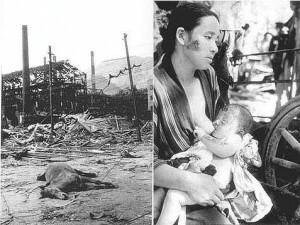 Because of the targeting of the city center, about 85% of the people killed in Hiroshima were civilians — vaporized or carbonized by the heat, crushed to death in the shockwave, burned to death, killed quickly or slowly by radiation poisoning and infections and cancers eating their bodies alive. 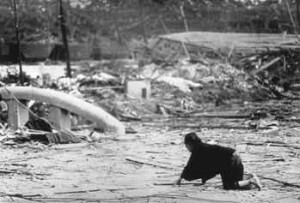 Others were killed by the force of the shock-wave or crushed under collapsing buildings. The explosion completely incinerated everything within a one mile radius of the city center. The shock-wave and the fires ignited by the explosion damaged or completely destroyed about nine-tenths of the buildings in the city. Somewhere between 70,000 and 80,000 people–that is, about one quarter to one third of the entire population of the city–died immediately. The heat of the explosion vaporized or burned alive many of those closest to ground zero. 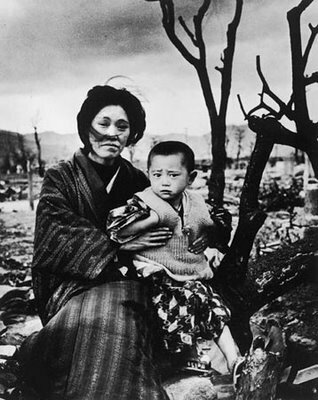 Thousands more died in the raging fires, from dehydration, from injuries, from cancers related to the radioactive burst or the fallout, and from radiation poisoning–their internal organs were burned away in the intense radiation from the blast, or from the fallout, and they died slow, lingering, painful and unavoidable deaths over the next several days or weeks. 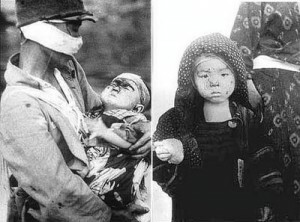 It is estimated that in all, the atomic bombing killed about 130,000-140,000 people, and left thousands more with permanent disabilities. Almost all of the people who were maimed and killed in the obliteration of the city were civilians. 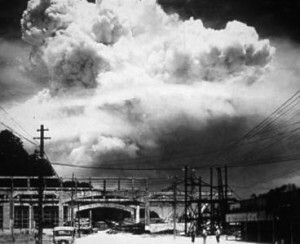 Although there were some minor military bases near Hiroshima, the bomb was dropped on the city center, several miles away from the military bases on the edge of town. Hiroshima was chosen as a target, even though it had little military importance, because It is a good radar target and it is such a size that a large part of the city could be extensively damaged. There are adjacent hills which are likely to produce a focussing effect which would considerably increase the blast damage. 1. 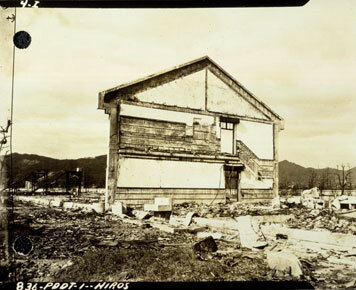 Hiroshima was also one of the largest Japanese cities not yet damaged by the American firebombing campaign. Military planners believed it strategically important to demonstrate as much destruction as possible from the blast. Thomas Ferebee, a bombadier for the United States Army, was the man who dropped the atomic bomb on Hiroshima. His commanding officer was the pilot of the Enola Gay, Paul Tibbets. Tibbets and Ferebee were part of the XXI Bomber Command, directed by Curtis LeMay. LeMay planned and executed the atomic bombings at the behest of Secretary of War Henry L. Stimson and President Harry Truman. Kengo Nikawa died on August 22nd, 1945 because of the bombing. This is his pocket watch. 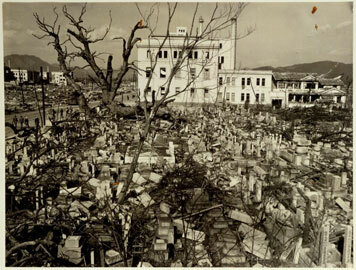 We will never know the names of many of the 140,000 other residents of Hiroshima who were killed by the bombing. We have only estimates because the Japanese government was in a shambles by this point in the war, and countless records, of those that were successfully kept, were consumed by the flames, along with the people whose lives they recorded. 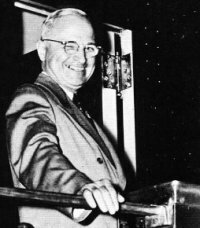 Harry S. Truman, August 9, 1945. We won the race of discovery against the Germans…. 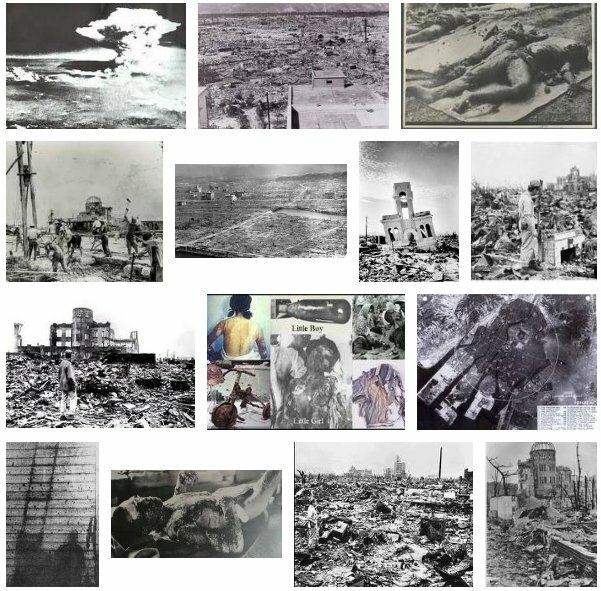 In his radio address on August 9, Truman disingenuously described Hiroshima, a port city of a quarter million people, as a military base, and then he said, That was because we wished in this first attack to avoid, insofar as possible, the killing of civilians. The bomb was dropped on the city center, over a hospital, far away from military installations. Having found the bomb, we have used it. We wished in this first attack to avoid, insofar as possible, the killing of civilians. We have used it in order to shorten the agony of war. 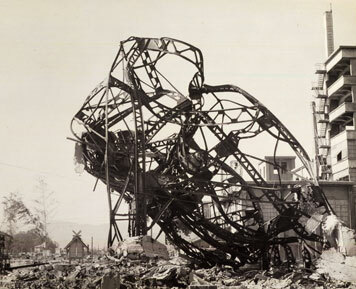 It is worth remembering that the atomic bombing of the Hiroshima city center — the first use of atomic weapons against human targets in the history of the world — a bombing in which the United States government’s forces deliberately targeted a civilian center — a bombing that the United States government carried out with the explicit intention of obliterating an entire city in seconds, in order to break enemy morale — an attack in which that government’s forces turned weapons on civilians that destroyed 90% of an industrial metropolis, and killed between a third and a half of all the people living in it — was, and remains, the deadliest act of terrorism in the history of the world. The audio clip above is from a recording of President Harry S. Truman’s radio report on the Potsdam conference, recorded by CBS on August 9, 1945 in the White House. The song linked to above is a recording of Oppenheimer (1997), by the British composer Jocelyn Pook. The voice that you hear at the beginning is Robert Oppenheimer, in an interview many years after the war, talking about his thoughts at the Trinity test , the first explosion of an atomic bomb in the history of the world, on July 16th, 1945. 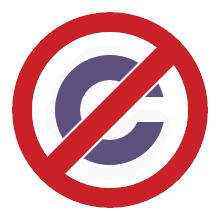 Anticopyright. This was written in 2014 by Rad Geek. Feel free to reprint if you like it. This machine kills intellectual monopolists.